Sunning early American mapping of Virginia. 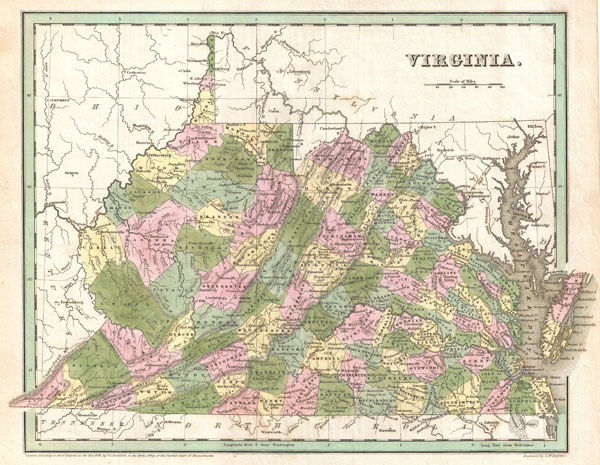 A fine example of T. G. Bradford's c. 1838 map of Virginia. This map covers all of what is today Virginia and West Virginia as well as the entire Chesapeake Bay and adjacent parts of Ohio, Pennsylvania North Carolina and Maryland. Cartographically sophisticated Bradford's map incorporates political and topographical data, naming cities, towns, rail lines, mountains, swamps, and rivers. Color coding at the county Level. Though dated 1838, this map is most likely from the 1841 edition of Bradford's Atlas. Exhibits fine coloration as well as G. W. Boynton's fine and elegant engraving. Bradford, T., A General Atlas Of The World, With A Separate Map Of Each Of The United States Of America., 1841. Rumsey 4453.027. Phillips (Atlases) 6092-29.